eBook PDF (93 Pages, 2.90 MB), Kindle, etc. Learn how to use Microsoft Windows Azure to quickly and simply host data-driven websites. This book will guide you through everything you need to know to succeed in developing cloud computing enabled web sites. With Windows Azure Websites Succinctly, you will develop the skills you need to be competitive in the modern web marketplace. 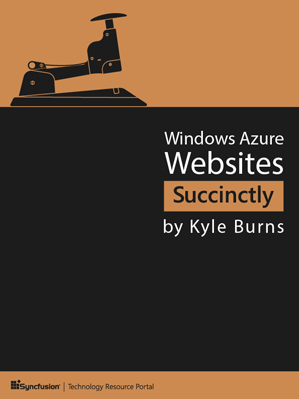 If you're looking for a straightforward, practical guide to get Azure websites up and running, then this is the book for you. This to-the-point guide provides you with the tools you need to move and maintain a website in the cloud. You'll discover the features that most affect developers and learn how they can be leveraged to work to your advantage. Accompanying projects enhance your learning experience and help you to walk away with a thorough understanding of Azure's supported technologies, site deployment, and management tools and how to monitor and scale their application.